What do you have on your computer? Finances? Emails, addresses, and other contact information? Precious photos? I’d include recipes, articles I’ve written, all the records from my small photography business, and the books I’m editing for my paying job. Can you afford to lose any or all of those file? I didn’t think so. I know I’d be in big trouble if I lost all our financial records, and I’d be heartbroken to lose all the photos I’ve taken, especially of our granddaughters. There’s a simple solution, but for some reason, it’s one that’s often ignored, or put off until later. Never write it down. If you have to write it, it’s either too complicated to remember or you have too many passwords to remember. I was recently criticized by a conservation-minded friend for leaving my computer on all the time. As I consider myself a fairly passionate environmentalist (at least in some areas), I took her concern seriously, and did some research. That is, I asked Pete, who is very knowledgeable in these things. Here’s a summary of what I learned. Help! I’m a digital addict! I may not be a digital native, but I must be a naturalized citizen. As I write this, I have just spent ten days away from home, visiting friends and family on the west coast. It was a great time, and I loved seeing everyone, but I’m ready to come home. Flying standby can give you lots of time to think… especially if flights that had plenty of open seats a few days ago are, on the day of departure, suddenly overbooked. After arriving at the airport this morning, I am hoping to finally make it onto a 5:45 flight this evening. In the meantime, here I sit. Trying to make good use of my time, I hopped on my laptop and tried to log on to the airport wi-fi. Hah, not so fast. Apparently, this airport has no free internet access, and I am not about to pay. But what about computers? Do home computer boxes need tidying up? They sure do! That horrible mess of thick dust in the picture isn’t just a hidden eyesore: it can be the cause of some very expensive repairs. 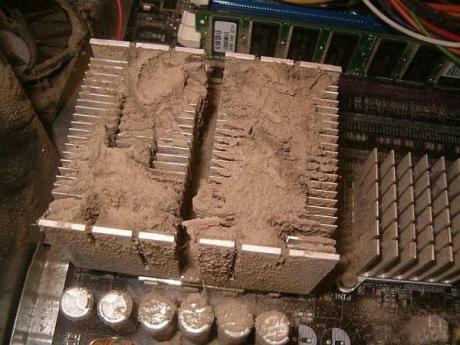 Built-up dust will cause your computer to use more power, to overheat, and ultimately the dusty grime will slow overload the fan motor(s) and burn them out. A burnt-out fan, if you are lucky, “only” needs replacing. But if the computer overheated due to the lack of fresh air, you might end up replacing far more expensive and valuable parts: your hard disk, the main board, or the power supply. That’s no fun at all. Note: this applies to both PC’s and Mac’s. No gloating, folks.